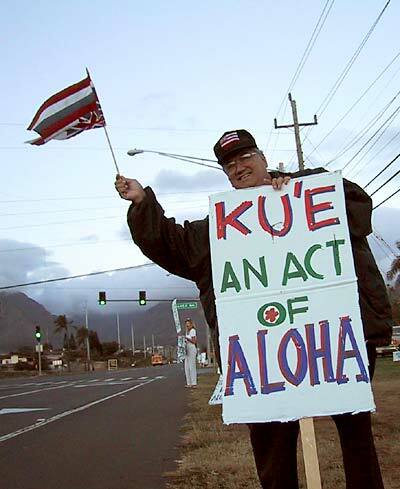 KAHULUI  It was just a small start to a plan to demonstrate Hawaiian concerns over the weekend at the Kahului Airport. About 30 Maui Hawaiians and supporters held a sign-waving demonstration Wednesday morning near the entrance to Maui Community College. "I'm a future homesteader," said Pua Jeremiah, "but I don't know if I'll ever get on the land." The demonstration organized by the Hawai'i Institute for Human Rights was intended to kick off the effort that is expected to grow Friday into a mass statement to the public. Native Hawaiians and supporters are gearing up to express their concern over the potential loss of rights posed by a lawsuit filed in U.S. District Court by a Honolulu man, Patrick Barrett. Barrett is seeking to invalidate Article 12 of the Hawaii Constitution. Article 12 provides for the Hawaiian Homes Commission and homestead program, for the Office of Hawaiian Affairs and for recognition of traditional Hawaiian access and gathering rights. The challenge to what Hawaiians consider traditional rights is seen as a threat to their identity, participants said at Wednesday's rally in Kahului. "I was born and raised in Hawaii. We are the past, the present and the future," Jeremiah said. "But I don't know if there is a future." She said she signed up for a Hawaiian Homes lease 13 years ago as part of a program to speed up the awarding of homestead leases. Her lease is for a parcel in a Waiohuli-Keokea homestead subdivision that has been developed but has not been opened to the lessees. "We have been waiting 13 years. They developed it but we can't build and we can't even get on the land. They must have known something was going to stop it," she said. James Jardine said he is a hunter who regularly goes into Maui's forests. He said he joined the demonstration to express support for unity in the community that depends on traditional uses. "We must protect our access rights, to gather the traditional things, the ti leaf, the maile," he said. Joshua Cooper, an MCC lecturer and director of the Institute for Human Rights, said the demonstrations are intended to raise public awareness of the issues in the Barrett v. Cayetano case. "Most people don't know what's going on," he said. "We are doing this in public so we can make people aware of the issues, so they realize the impact of the legal process in their own lives." Cooper, who lectures on peace issues and political science, said the demonstrations planned for the Kahului Airport are intended to be informational and nonviolent. "It's the way Hawaiians have been, starting with Queen Liliuokalani. Hawaiians have been nonviolent," he said. Cory Brown, who has his own marketing business, said he is less concerned about possible loss of his family's Hawaiian homestead at Waiehu than the broader threat to tradition and to cultural values. 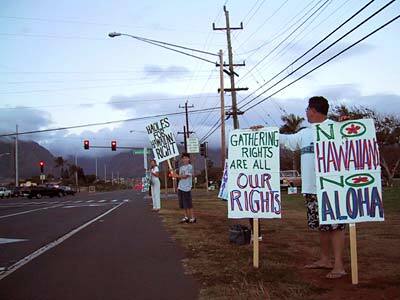 "It is threatening more than whether there will be Hawaiian Homes land or not. The issues extend way beyond that," he said.